Spa destinations are evolving all over the world. Essentially a spa destination is a resort that is dedicated to lifting you completely from the familiar patterns of daily life with the expectation that when you do return you will be refreshed and invigorated through the use of their spa. In each resort the mind is offered a different surrounding atmosphere ranging in style from soothing massage and relaxation to an active schedule for fitness. One spa destination I visited believes that the key to renewal is to be dramatically romantic and offers an all adult environment. Another focuses on family interaction combined with active sports followed by relaxation, aromatherapy and fine dining. In each the body is nurtured by its fabulous food which runs all the way from light, lean and fresh meals presented with creative elegance to rich dining that is practically an immersion experience. 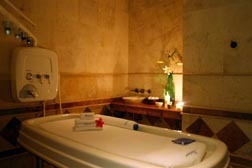 In each resort the soul is nourished with its spa. Each spa specializes in treatments of massages, wraps, soaks and scrubs to offer the best of beautification, purification and rejuvenation. The whole experience at each place I visited is about renewal, being refreshed, pampered and reborn, made ready to face the rigors and disciplines of daily life with a fresh eye. It is left to you to choose the location, style and atmosphere in which this will be accomplished. I was searching for a mind, body and spirit rebirth surrounded by wide white beach and perfect blue water. 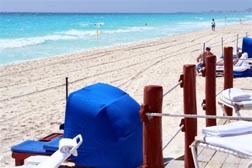 The reason I chose Cancun, Mexico is because it is easy to get to with generally inexpensive fares. I left Burlington Vermont at 7:25 AM and was in Cancun in time for lunch. No hassles, perfect. 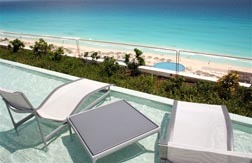 Each of these spa destinations I found is within a half hour of the Cancun airport. 40 miles south of Cancun lies the spectacular Riviera Maya, miles of wide white beach, and a Caribbean blue ocean that has you taking off your sunglasses to check the reality of the color. Past a small sign and down a long sandy road lies the inclusive spa resort of Paraiso de la Bonita. Freshwater pools of harmonized blues and the rolling luminescent ocean is instantly soothing. Walking between ponds swirling with multi colored coy under a high peaked grass roof to pass through the 15 foot tall adobe walls I saw an enchanting world, very far from my normal life. Glistening white beach and graceful palms and beyond that the tropical turquoise ocean merging with the clear dense indigo sky. Very far from my normal life actually. Leaving the mid day sun the cool adobe spa area is the first step into a timeless physical refreshment. I had my first Thalasso therapy at the spa at Paraiso de la Bonita, and it was a stunning demonstration of the befits of the nutrients, minerals and phytoplanktons from seawater. The 80 minute treatment begins in a dark quiet room with an aggressive sea salt scrub that I found invigorating, leaving my skin tingling and receptive. This was followed by the gentle sensation of salt water rain delivered by the Vichy shower set at the perfect temperature as the granular salt rinsed away with long smooth strokes. lotion with emollients and phytoplankton from the depth of the sea was then massaged into my thirsty skin. I felt fresh, silky, almost langorous for days afterwards. Our favorite dining area is open to the breezes where the menus offer a wide spectrum of taste and texture including the most delicious avocado salad I have ever tasted. There are three choices of places to dine, including in your suite. The suites at Paraiso de la Bonita are airy, spacious and instantly welcoming. They all have places designed to sit out in the evening by candle light and let the ocean work its magic. The total experience is designed to create memories completely disconnected from stress of outside life. Services are delivered with such invisibility as to appear telepathically . Safely tucked between the mangroves and the pristine beach, surrounded by the perfect colors of the Caribbean sea, exquisitely fed and pampered by very talented hands it is hard to even remember that there is an outside world. 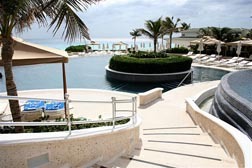 At the heart of La Meridian Cancun is its Spa del Mar, which is deservedly famous as a transforming experience. I had the most rejuvenating facial of my life at the Spa Del Mar, given by a tiny sweet mayan lady named Aydeth in 50 minutes that seemed to last forever and was too short all at once. The treatment rooms at Spa Del Mar are dark and quiet and made me feel as if I was alone in the universe being pampered by thoughtful kind people to the sound of gently falling water and soft ethereal music. Afterwards we visited quiet rooms where we sipped chlorophyll water in complete relaxation, and lingered in the peace that we found from our treatments. The hotel rooms are large, each one with a view of the ocean as well as the swirling blue pools with islands and waterfalls that drift in sequence down to the perfect turquoise ocean isolated from the outside world by the resort itself. 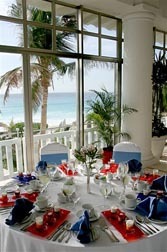 There are several restaurants available to guests at La Meridian Cancun, each with its own style and presentation. We had breakfast one morning in a glass sunroom which had the benefits of feeling outside without the heat or direct impact of the tropical sun. 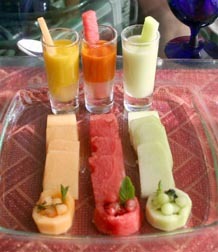 The Spa Food part of the menu included fruits cut into beautiful shapes and blended with mint and yogurt, followed by poached eggs on delicious thin toasts covered with rich cheese sauce that left us feeling deliciously satisfied and eager to relax at La Maridien Cancun. Located in the heart of the busy downtown area of Cancun, Spa Aqua is an immersion into renewal of the spirit from the instant we stepped out of the bustling of the city. Just up the hill from the sounds of traffic, the smell of hot asphalt and the intense tropical sun we entered a 30 foot tall glass atrium. The interior was filled with the calm green light of a jungle grotto, the gentle sounds of water falling into a shallow pool surrounding the black water mirror in the center bringing refreshing cool of a woodland stream to our senses. At the same time the faint sounds of ethereal music quietly infuse peace of mind. Just walking into the atrium removed us gently from the ways of the hot busy world. Spa Aqua is a spa with the added facilities of handsome rooms, graceful fresh water pools and four different styles of restaurant, not to be confused with a hotel that has a spa. The spirit of the people who work there is reflected in the way they greet each other in passing. A hand to the heart, very slight bow and the mayan greeting “in la ceche” meaning “I am you, you are me, we are friends”. It is a small gesture, but once we got used to seeing it we really began to appreciate a world where people stated such communion as casually as we say “hi”. The spa is dark, tall and mysterious, filled with spare woven furniture and tall black pottery candle holders as it wanders around with the passages cool and tranquil, offering seemingly entrance randomly to softly lighted treatment rooms. I had an aroma sensory massage that did in fact take me away from the life I knew outside. Worlds away, 80 minutes seemed truly timeless in its peacefulness, followed by lingering in quiet candle lighted meditation. 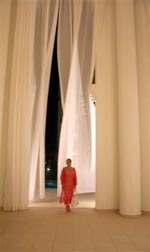 “Ka a yaan tah” is a mayan expression meaning “to be reborn” and is the core philosophy of the Ritz Carlton Cancun. The 5500 square foot spa sheltered from the intense tropical sun, offers welcoming quiet and diffused light of the Kayanta Spa folded itself around us as we entered from the beautiful pools and gardens in the center grounds of the hotel. I had the aromatherapy massage. It began with a detoxifying massage which not only left me feeling completely cleansed and removed from the elements of every day life, but also calm and relaxed within the scent of herbal oils. The flow element seemed to produce a balance of relaxation and excitement about the future which either came from or was reflected by the different blend of herbs used in the treatment. And finally, the tonic of fresh invigorating and stimulating therapy that filled me with excitement. I wanted to write, paint and stimulate my senses with water, wind and laughter. I enjoyed this spectrum of sensations enormously. 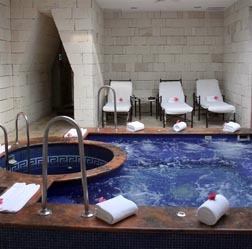 Surrounding this Kayanta Spa is a lovely hotel, in grand Ritz Carlton style, with a series of blue tiled pools with different temperatures so that we could find our preferred relationship with the day’s weather. 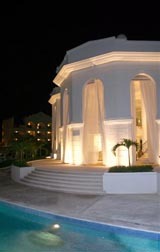 Large raised and shaded palapas are for guests use between the pools and the ever present glowing Caribbean. These are a purely delightful way to spend a day, lunch was delivered and of course cocktails. We were asked to reserve them in advance as they were very popular and you would be wise to book one ahead. We arrived at this spa at night and it could not have been a more dramatic impression if we had landed on another planet. Secrets Excellence appeared as a regal ethereal city, with tall clean lines, sweeping curves and blistering white walls reflecting the glittering turquoise from the lighted pools as we approached what seemed to be a temple in its center. With arches 30 feet tall the billowing white curtains gracefully drifting in the evening breezes promising secrets and mysteries within. This combination of pristine white walls and reflecting water carried through to the inside of the spa, with its many types of hydro therapy, massages and wraps. We saw some of the most beautifully designed and crafted pools that I have seen anywhere in this spa, blended with slender pillars, tall arches filled with graceful white drapes gently shifting in the breeze that inspires the soul as well as nourishes the body. Romance is everywhere. This is an adult only resort where the assumption is that you came to have your senses seduced in every way. There are seven restaurants within this mystical city, each with its own style and variety of menu united in the passion elevating concept. Doors passed in the hallways had banners that said “honeymoon” or “anniversary” in gold letters proclaiming the joy of those within. Many small places within this city were created for two, to sit and talk, caress or share a glass of wine.